I’ve gotten a little bit of static from family and friends about the choices we made for the baby registry. Like everything baby-related – from names to child rearing – unsolicited opinions abound. I remember the same raised eyebrows (from some of the same people) when we registered for our wedding. I know, I know … a hundred-dollar nightlight IS crazy expensive and we probably won’t get it. It’s there because we liked it. Sue me. Everything else, however, was chosen for a reason. Every item was heavily researched and carefully considered. It isn’t just a load of stuff that’s oh-so-cute but won’t get used. We need things we can use for years or use in another room of the house later, not something cheap that we’d have to replace in a few months or years. As urban city dwellers, the list is tightly edited to save on physical space and create convenience. We’re all about having fewer things, but much better quality. 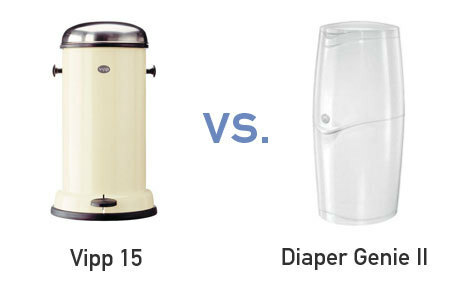 The diaper pail seems to be causing the most consternation. VIPP trashcans are built by hand in Denmark. They are ultra-high quality and are designed to last a long time. In reality, it’s not a diaper pail but a medical-grade trash can that can be used as a diaper pail. The VIPP workers are well paid (with healthcare) and the company is environmentally responsible. They’re a family-run organization that’s been making bins since 1931. On top of that, the VIPP 15 (part of the MoMA collection) is a great piece of industrial design which, for us, is just as important as function. If spending $319 on a trashcan results in purchasing fewer cheap Chinese equivalents – which are not well made, whose workers are not well paid, whose quality doesn’t conform to safety standards, and whose factories do not care about the environment – well, that’s cool. But let’s break it down: The Biscuit will be in diapers for about two years. We’ll be using this trashcan every day and it comes with a 10-year warranty on all moving parts (does your Diaper Genie have that?). $319 over 730 days is just 44¢ per day for something that works well and looks great doing it. Yes, the initial outlay seems outrageous but this isn’t about price. It’s about value. In my opinion, the price of a VIPP trashcan reflects the true cost of a well made, ethically produced product, and is not “ridiculous” as it appears. Americans have simply grown too reliant on Wal*Mart prices, without considering the social consequences of what that means or the overall VALUE of what they’re actually buying. Ultimately, we know that friends and family who want to shop for The Biscuit will do so within their means and we’ll be eternally grateful for WHATEVER gifts we receive. I would never judge someone based on what they can or can’t afford. We prefer not to be judged based on our product preferences, however “indulgent,” “ridiculous,” or “bourgeoisie” they may seem to those on the outside.